NASA has a new "mothership" aircraft, a former U.S. Air Force (USAF) B-52H bomber that has been modified into a flight research vehicle launch aircraft. Now, the bomber-turned mothership joins NASA's other B-52, the famous "NASA 008," in air-launching some of NASA's most advanced aerospace vehicles. 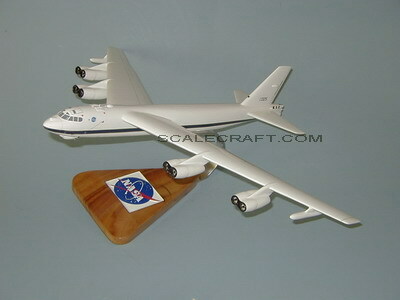 NASA's Dryden Flight Research Center, working with the USAF, modified the B-52H by first removing the aircraft's classified military systems, then adding flight research gear. Following the year-long modification process, the B-52H has flown several checkout flights to verify the newly installed systems. These flights, like actual research vehicle flights, are monitored by engineers on the ground in the mission control center at NASA Dryden. Mahogany Wood. Scale: 1/100. Wingspan 22 1/4 inches, Length 19 inches.